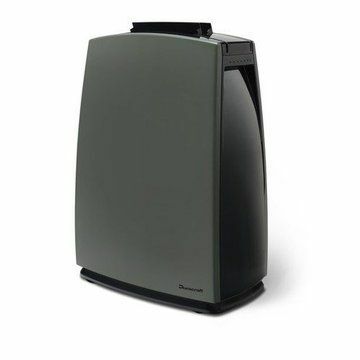 The Duracraft DD-TEC16E, Duracraft 24hDD TEC16E or DD-TEC16E1 as some shops call it is the only ‘modern’ dehumidifier that Duracraft sell. I’d never heard of Duracraft so did a bit of digging to see how reputable they generally were and it seems they were bought in 1996 by an arm of Honeywell, which was subsequently sold to a couple of different privately held companies. The DD-TEC16E is up against some significant competition in this section of the market, including the excellent DeLonghi DES16E, so in this review it’s going to have to impress. Our favourite feature of the Duracraft model is referred to by the ‘E’ in the DD-TEC16E title, which is the top-mounted electric control panel. This includes a digital display and 4 buttons controlling humidity, fan speed, the timer and an on/off switch. We liked that the humidity could be set to either 50%, 60%, 70% or 80% relative humidity using the inbuilt humidistat, rather than having a ‘min’ to ‘max’ type setting. We’d recommend that you either select 50% or 60% humidity (40% to 60% relative humidity is considered to be the ideal), depending on your personal taste and just leave it on that setting permanently and let the machine automatically control the rest. 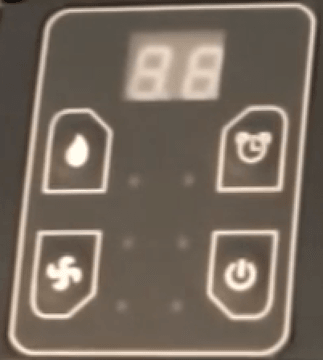 The machine comes with two fan speeds, which is a nice feature that gives you the power when you need it (e.g. drying laundry), but keeps the machine quiet during day-to-day operation when you should select the lower speed. The timer is another nice function that lets you set a particular number of hours you’d like the machine to operate for before turning itself off. Ideal if you’re out for the day and don’t want it running the whole time, or, say, to give laundry a one-hour blast. This is basic stuff, but still relatively rare to find on dehumidifiers. As you’d expect there’s an auto-drain ability and Duracraft supply a frustratingly short section of the appropriate diameter pipe, should you wish to utilise this. If you aren’t able to site the DD-TEC16E near to a drain to implement the auto-drain ability then you’re going to have to use the inbuilt bucket, which is a little on the small side for this power of machine at just two litres. During normal operation that means that you will be emptying it at least once per day. Frustratingly there’s no way of telling how full the bucket is without stopping the machine, opening it and peering in. It’s also located on the reverse of the machine, which means you’ll need to turn it around to access it. The bucket itself is quite tall and narrow, with no lid. Tall buckets tend to be less prone to slopping water over the sides, so we’ll let Duracraft off for the omission of an appropriate lid. However there also isn’t any means of carrying the bucket, other than cradling the whole thing, which is a shame. The DD-TEC16E comes fitted with a dust filter, but no other form of air filtration (e.g. 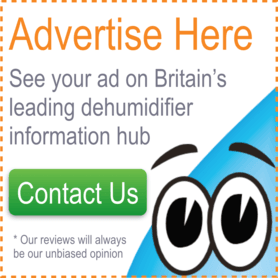 anti-microbial filters, ionisers), but to be fair to Duracraft, it is still fairly uncommon for refrigerant dehumidifiers to have air filtration beyond a dust filter. Finally, the exit point for the air is at the top of the unit and there’s an adjustable flap which allows you to point the air within a roughly 90° range. Portability is a really poor area for the DD-TEC16E. First off, it weighs a whopping 14kg, so watch out for your (or the delivery man’s!) back when carrying it. It is a lot heavier than many of it’s rivals, which on average weigh-in at a more respectable 10kg. Secondly, the only sort of handles are little more than indents on either side of the machine, towards the top, which, when coupled with the weight, mean you’ll be walking around like a hunched gorilla while carrying it. Thirdly, with dimensions of 48cm high by 39cm wide by 25cm deep it is a lot wider and deeper than many of its rivals. The redeeming feature for the DD-TEC16E is the castor wheels that it’s mounted on, which make turning it around to access the collection bucket or moving it from spot to spot much easier. Design was a tough criteria to judge, as we feel this Duracraft model does look very good. It’s nice to have a dehumidifier that isn’t in ‘appliance white’ and the matt dark grey front and piano black top feel like good quality plastics. It does go down hill when you turn the unit around, with a large, ugly intake grille and cheaper grey plastics, but remember that you’re likely to be the only one viewing that side (i.e. when you’re emptying the collection bucket). I think that the design of the DD-TEC16E is a little bit form-over-function, with the intake being on the side of the unit that faces the wall (not good for air circulation) and little in the way of handles. However the good looks are probably a major contributing factor to many looking to purchase this particular machine. 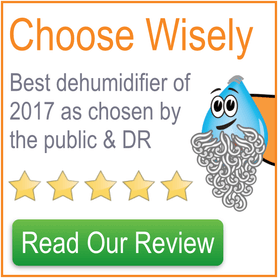 Comparing the DD-TEC16E to other refrigerant dehumidifiers, it is by no means the quietest, but it is also not the loudest either and certainly livable with. The majority of the noise comes from the fans, rather than the compressor, so it’s more of a ‘white’ noise that is easier to live with. The video above will give you a better indication of the noise it makes than I ever could, so I suggest you listen to that. The Duracraft DD-TEC16E performs inline with the rest of the competition here. It’s not the most powerful, but is still very effective. Just remember the sixteen litre per day rating is measured at 30° and 80% relative humidity, so don’t worry that you’ll be emptying the collection bucket 8 times per day. In the typical UK climate, once the dehumidifier has ‘bedded in’ I’d expect to empty the collection bucket (2L) once per day. We’d recommend the model for homes that are up to four bedrooms in size. In conclusion, the DD-TEC16E is a reasonably effective, attractive, but large and heavy mid-level dehumidifier with an easy to use control panel. If that sounds like the model for you then be careful, because it is not even nearly worth the RRP of £240, for that price there certainly are better choices. However usually there are some rather large reductions, of which the largest we could find was at this shop, so feel free to give that link a try.